The tarot Star is always a pleasure. It’s a pleasure to see in a reading and a pleasure to think about (tarot nerd alert!). The Star is a card that, no matter how long I spend studying it, there always seem to be another level to discover. I seem to love what I don’t know about the card as much as I love what I do know. So it brings me a great deal of joy to talk about The Star in the Luna Sol Tarot! So, let’s begin. How many stars are within the tarot card The Star? Eight – one large, central star and seven small. Just as this is card number 17, 1 and 7. What asterism (a recognizable pattern of stars) has seven smaller stars connected to one large star? The twisted branch with the butterfly on in the Luna Sol Tarot provides a clue: The Big Dipper, or Plough, which is part of the constellation Ursa Major and is probably the easiest asterism to identify in the night sky. 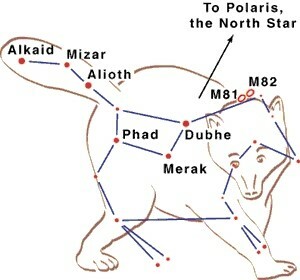 The last two stars at the end of the dip, Merak and Dubhe, point the way to finding another important star, Polaris (the North Star) which is part of Ursa Minor. The one and the seven. The stars of Ursa Major and locating Polaris. Image via Night Sky Interlude. Historically, these stars have had a significant role in guidance. In the Northern Hemisphere, the North Star appears motionless in the sky and is visible throughout the year due to being the brightest star closest to the celestial North Pole. The angle between the North Star and the northern horizon is the same as your latitude north of the equator. So now you know roughly where you are. The Big Dipper is circumpolar – close to the celestial pole – and again, from certain latitudes, visible throughout the year. The Earth’s daily rotation around its axis makes it seem like the stars close to the pole revolve around the pole once a day. Looking at the position of the Big Dipper at night can be used to estimate the time. So now you know when you are. These eight stars can guide you in both space and time. This sense of receiving aid is so welcome in the tarot, especially because it follows The Tower, with its associated destruction of things that seemed irrefutably solid. The woman pouring the water, partly on to land and partly onto water, recalls the angel in the tarot card Temperance and also the astrological sign Aquarius. The mind is at play here. Water pouring from the vessels, a symbol of the unconscious, as it was in Temperance; Aquarius is an air sign, naturally meditative and excellent at mental pursuits. From the depths of the subconscious, an inspiring thought has struck the woman in The Star. 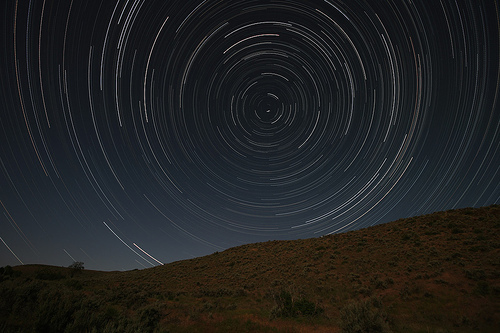 Like Polaris, it could provide guidance, hope, a destination to set course for. It invites us to wish and wish big! Look for inspiration. Embrace optimism and hope. Set goals knowing that now is a time when they are truly achievable. Wonderful news! Following a very successful Kickstarter campaign last summer, Noel Arthur Heimpel’s awesome Numinous Tarot deck is now available through direct sales. We heartily encourage you to have a look at this bright, joyous and inclusive tarot deck! As ever, visit our social media to tell us what you think about The Star and our other Luna Sol Tarot cards! And sign up for our newsletter to find out when we open pre-orders for the deck.